In Ferguson, Mo., at least three permanent monuments recall Mike Brown. 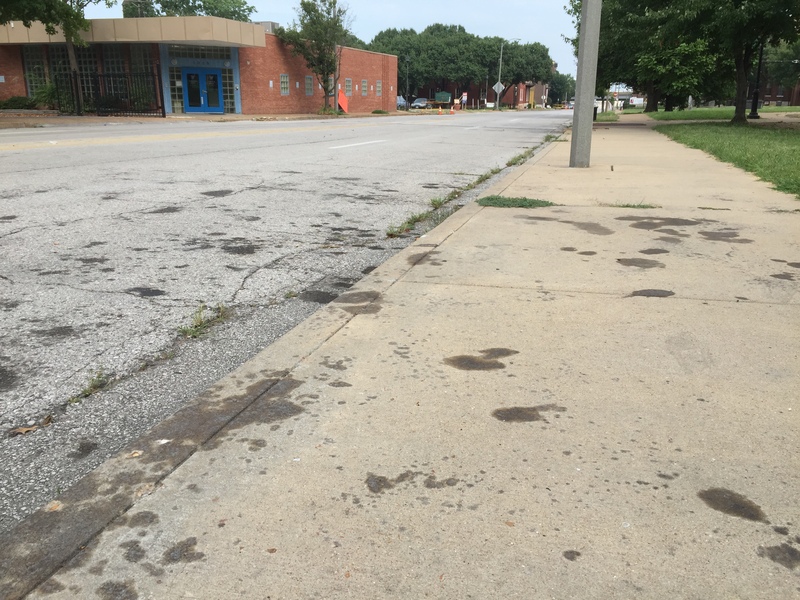 In south St. Louis, there are only stains on the street where William Crume and Angela Wysinger perished. In Ferguson, a brass plaque bearing Brown’s likeness and another plate shaped like a dove flank where he was shot dead in the street at Canfield Green apartments a year ago. On the spot where the teenager’s body lay in the summer sun for four hours is a rectangle of new asphalt; Brown’s family had the old asphalt scooped up as a keepsake. In south St. Louis, dark, greasy stains from candle wax remain on the pavement and sidewalk at 11th Street and Park Avenue in the LaSalle Park neighborhood. There, near a concrete light pole, is where Crume and Wysinger died in March, killed in their car during a drive-by shooting. Two days afterward, about 70 people lit candles and stood in silence around a 17-foot wrap of balloons, ribbons and stuffed animals tied to the pole as a memorial to the couple. Brown died in a confrontation with police officer Darrin Wilson. Brown was said to be unarmed. Wilson shot six times at Brown for reasons that protracted scrutiny has not made entirely clear. Crume, 23, and Wysinger, 26, were killed as shooters from at least one passing vehicle fired multiple times into their car as it rolled east on Park Avenue. The shots also injured one of Wysinger’s three children – ages 2, 7 and 9 – riding in the back seat. Police say Crume and Wysinger were unarmed and probably knew their assailants. Brown’s death triggered weeks of unrest in Ferguson and turned a magnifying glass on the way some municipal governments and police perform their duties. In many communities around the country, officers now wear cameras on their uniforms to account for their actions. Little has happened in the wake of Crume’s and Wysinger’s deaths. The authorities presume the shooting was an act of retribution but still do not know who is responsible. This week, millions of people worldwide remembered the events in Ferguson on the first anniversary of Brown’s death. This week, hardly anyone will remember Crume and Wysinger. But the young couple also deserve our attention, our remembrance, as much as Brown. His death, though tragic, raised awareness of pervasive social and legal imbalances in our government and the courts, and hammers home the need for changes in how the public and police deal with each other. Crume and Whysinger died in an act of rage that hammers home the stark reminder of our obligation to be just and civil to one another. Lacking that, we risk leaving a legacy that amounts to little more than wax stains on sidewalks. Bright, multicolored balloons twist and bob around a concrete light pole about 20 yards from my backyard gate. People of all ages took photos of the balloons even as children tied more onto the pole. In the adjoining community park, a couple hundred people talked, laughed, cried and held each other during a memorial vigil Tuesday as they recalled what happened a few feet from that light pole 24 hours earlier. A bullet-riddled Nissan carrying two adults and a 9-year-old girl had rolled to a halt with one of the adults already dead and another dying. The girl was wounded but would survive. Their ride ended after a 12-block shootout with the occupants of another car who authorities say were targeting the couple. I had heard the yelling from bystanders outside my second-floor window before realizing what was wrong. I saw the car go by, followed briefly by four people sprinting after it on foot. By the time I made it downstairs and out the door to investigate, a handful of wailing, distraught people were already reaching into the car to pull out the victims. Police arrived mere seconds later. A detective at the scene told me they were receiving 911 calls about the shooting before the car had reached a full stop. Once they turned the corner, they only had to follow the sounds of the wailing. More people rushed to the scene on foot at almost the same rate as the police, who drove in aboard 17 patrol cars and immediately closed the street in both directions. Officers cordoned off a wide area that extended all the way to my gate hinges. The police anticipated trouble. When large numbers of African Americans are involved, they assume as much and show up en masse. Ferguson – 12 miles northwest of here – is to blame for that. The victims in the car were African American. The detective said the suspects likely were African American, and the growing crowd was upset and almost exclusively African American. But the tension that was anticipated never materialized, because there was no rage, only outrage and frustration. The police were there like the rest of the crowd, trying to understand what brought two young lives to such a violent end on a tree-lined residential street, probably at the hands of someone equally as young. One officer bent down on one knee just outside the loop of yellow police tape to talk with a group of boys, none of whom appeared older than seven. All of them, including the officer, had the same stunned looks on their faces, because at what age does one truly understand how anything like this can happen? Then screams pealed out from several of the 70 or so people watching across the street in the park. They just learned the other adult in the car had died at the hospital. At that, the crowd started to dissipate, with the strong and resolute assisting the inconsolable. The armada of patrol cars dwindled to 12, to eight, to two. The car that held the victims was the last to go, on the back of a flatbed tow truck, beneath the pale glow of that now-landmark street light, the only odd thing at that point being the sight of a single officer standing in the road watching the cargo being loaded. For me, the hardest part was seeing the pain in the faces of those who either knew the victims or knew that this kind of internecine violence was not about to end. They were worried for their children and their friends and family, and said as much out loud, over and over. The police would be no help; the solution had to come from within. And so the vigil formed around 5 p.m. Tuesday and lasted well after sundown. About 200 people showed up. They brought flowers and balloons, and a couple brought barbecue kettles. Posters of the dead were pasted to the light pole. The wrap of balloons reached 12 feet in height. And yet, police passed by only infrequently because for this second gathering the people themselves were doing the policing – directing traffic and trying to keep order. I spoke briefly to a few of the people trickling in and out; they replied in broken voices about taking back their lives. “It’s up to us to stop this. It’s up to us to stop this,” one woman muttered. We should all follow that advice. The best journalist in America in 2014 isn’t American and isn’t a journalist. He intends to change only one of those things. As for the journalist part, Oliver insisted on PBS’s “News Hour” that the title is misapplied. Given his latest performances on television though, one is left to wonder otherwise. The British expatriate and Cambridge University graduate settled in this country upon joining the staff of Comedy Central’s popular “The Daily Show with Jon Stewart” in 2006. Between assignments, Oliver continued to do stand-up routines and podcasts on both sides of the Atlantic, each refining a style of wit reminiscent of Monty Python. He obtained a Green Card in 2009 and considers himself a permanent U.S. resident. Then in the summer of 2013, Oliver sat in the “Daily Show” host’s chair for eight weeks while Stewart was off directing the movie “Rosewater” and in that time Oliver displayed a formidable enough stage command to establish himself as Stewart’s likely successor. But before the notion could percolate longer, HBO plucked him out of Stewart’s stable to host the premium channel’s brand new Daily Show-esque enterprise. What followed was a masterful mix of humor and social commentary that major news media should watch carefully — and learn from. “Last Week Tonight with John Oliver” does indeed borrow from the “Daily Show” style of squeezing satire out of social and political events and blowing them up to absurd, sometimes mocku-mental proportions. But where the 30-minute “Last Week Tonight” truly distinguishes itself is in the show’s feature pieces, which can last half the program. Among the notable long-form bits in the show’s first 25-episode season were an analysis of Miss America scholarship claims, a look at chronic corruption by World Cup organizer FIFA, and a breakdown of the hypocrisy endemic in the American lottery system. Oliver does not just parse words. His staff includes former magazine researchers as well as comedy writers who sift for truth as much for laughs. Oliver and his crew understand that a little bit of bizarre behavior floats on the surface of authority and that by shining a light on it we can peer down into, and be less intimidated by, the darkness beneath. “Last Week Tonight” even displays key information over Oliver’s right shoulder on the screen, noting also the source and publication date. Not even network newscasts do that. This commitment has enabled Oliver to navigate stridently dense, solemn topics such as America’s wealth gap, civil forfeiture, and student debt — topics journalists have reported on many times but with a predilection for the somber seriousness of suffering by which most events are judged newsworthy. “There is something about playing with toys that are that difficult which become more satisfying to break by the end of our week’s process,” Oliver says. Not just break — shatter, really. 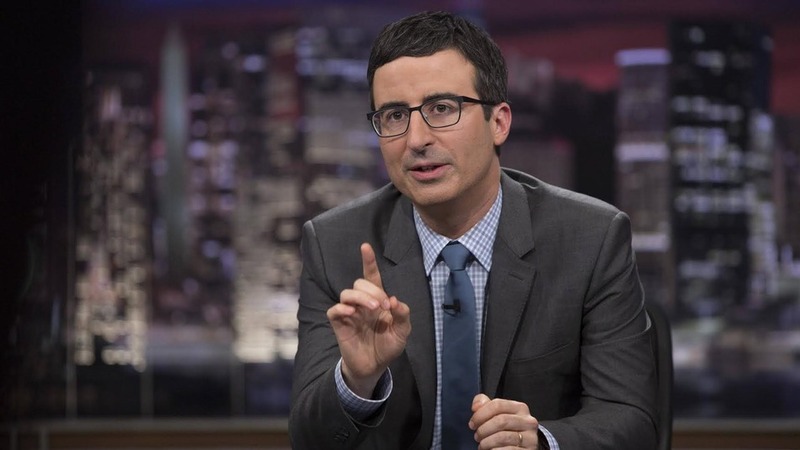 “Last Week Tonight” garnered 1.1 million viewers on Sunday nights. Across all platforms including DVR and on-demand showings, overall weekly viewership topped 4 million. But on YouTube, where “Last Week Tonight” continues to show its vigor months after signing off until February, a feature broadcast in July on the wealth gap has been viewed since then nearly 6 million times. The piece on civil forfeiture has more than 4 million views. The piece on student debt has 3.6 million. A feature on the typically arcane subject of national elections in India has garnered 2.5 million YouTube views. (HBO releases each segment separately onto YouTube after their initial broadcast). “It didn’t make any sense to me that the largest exercise in democracy in the history of humanity was not interesting enough for (the major news media) to cover,” Oliver says of the India feature. India has 1.2 billion people; the United States, 320 million. Even Oliver’s exposition on events in Ferguson, Mo., in a piece mixed with equal parts humor and outrage just one week after Michael Brown’s shooting now has more than 5.5 million views. That number has grown by about 10,000 weekly. Meanwhile, Oliver’s most talked-about feature, the one about net neutrality that was blamed for crashing the Federal Communications Commission’s website, is cruising toward 9 million viewers. All these numbers constitute a larger audience share per feature than the major news networks can muster per night. What Oliver and “Last Week Tonight” have managed to do is find a way to engage viewers and keep them engaged on complex, contemporary issues long after the initial broadcast while managing to be informative, a puzzle that network news and newspapers still struggle to accomplish two decades into the digital era. Journalism in its most basic form is the gathering, processing, and dissemination of information related to a particular audience. By that simplistic definition, Oliver qualifies as a journalist. But in making people laugh, Oliver goes to journalistically admirable lengths to do it. In the feature on Miss America scholarship funding, which the nonprofit Miss America Foundation claimed was $45 million annually, the “Last Week Tonight” staff spent days sifting through 990 tax forms on nonprofit spending from 33 states right up until broadcast to try verifying that number. The amount turned out to be unjustifiable, but “Last Week Tonight” nevertheless discovered that the Miss America Foundation is indeed the largest provider of scholarships that are just for women — which news media then reported. This is not to say America’s daily news needs a thick layer of humor to help it glide along, or that professional journalists are less capable of engaging audiences than Oliver & Co. But if an expat Brit can reach more people on tough topics than the major news media and incorporate impressive feats of news gathering and accountability while doing it, then the “journalist” label will stick to Oliver no matter how hard he tries to shake it off, and major news media will be compelled to watch him try. So, Oliver’s success and that of “Last Week Tonight” raises the question: If the major news media have a responsibility of informing and enlightening the public and still struggle at it, what exactly are they doing? Twitter already is a powerful news aggregator and microblogging platform. Now, two University of Missouri researchers think they know how to improve it. Their thinking stems from new software the pair developed that they say considers the context of tweets, not just the quantity. At present, a topic is popular or “trending” on Twitter if there are a high number of related keywords and hashtags that are associated with it. 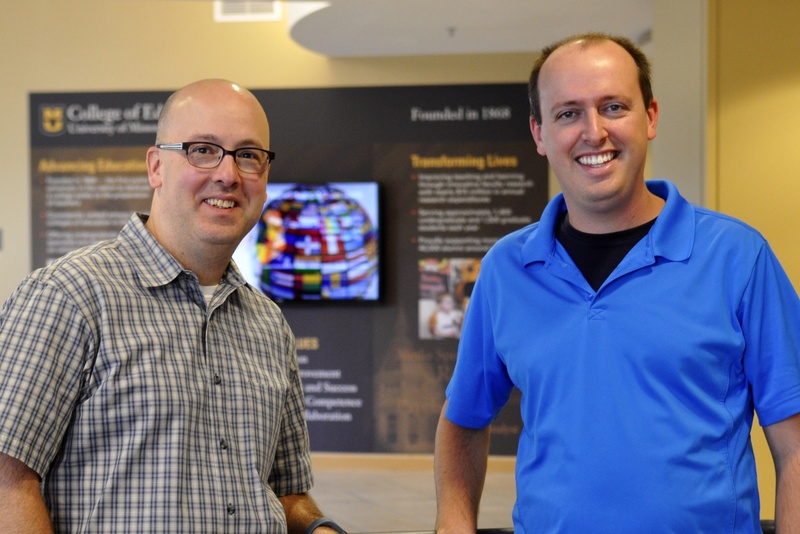 But the software, developed by Mizzou assistant professor Sean Goggins and doctoral student Ian Graves, can be programmed to pick out words and analyze their placement within tweets. Goggins and Graves said they tested their concept on a flurry of tweets from the Super Bowl and World Series and assigned tags to words they predicted would be common in the two broad conversations. The software scrutinized where the words were located in each tweet, thus giving the researchers notions on the words’ contextual importance and allowing them to see how conversations evolved. “When analyzing tweets that are connected to an action or an event, looking for specific words at the beginning of the tweets gives us a better indication of what is occurring, rather than only looking at hashtags,” Goggins said in a Mizzou news release. In tracking word placement, the researchers were able to determine the nuance attached to each Twitter discussion. They could discern the action on the ball field between pitches and on the gridiron between plays. “The program uses a computational approach to seek out not only a spike in hashtags or words, but also what’s really happening on a micro-level,” Graves said. “By looking for low-volume, localized tweets, we gleaned intelligence that stood apart from the clutter and noise” associated with each event. Goggins and Graves believe their software will help make Twitter more effective for monitoring community safety and tracking disaster relief, and improve understanding of cause and effect in major events such as the bombings at the Boston Marathon and the protests in Ferguson. Although less than 5 percent of Twitter traffic is actual news, much of the dialog that drives retweets and hashtags relates to newsworthy events. Goggins teaches in the School of Information Science and Learning Technologies at Mizzou. Graves is a student in the Computer Science and IT Department at Mizzou’s College of Engineering. Nora McDonald, a graduate student at Drexel University, contributed to the study, which appears in the journal New Media and Society and was funded by a grant by the National Science Foundation.